LEDs (Light Emitting Diodes) have actually been around for quite a long time. The first visible LED was invented in 1962 and was subsequently used as a “power on indicator light” for appliances like stereos. So how far have we come in 50 years and where are we heading? The biggest difference between what was around in the 1960’s and 1970’s and now is the brightness or “lumen output” and color that can be obtained. Back then LEDs were pretty much limited to very small pinpoints of light with very low brightness, and only available in red or green. The positive aspects were that they would last virtually indefinitely. How many times can you recollect a power on indicator light going out? Around 1990 LED technology changed when the color blue was achieved. What is so important about blue? Blue, when combined with other ingredients gives out white light. I am sure you now can see the enormous potential. Once science figured out how to make white light from an LED and once they figured out how to increase the brightness “Lumen Output”, they were then on their way to making a substitute for the standard light bulb which, up till now has been the standard since the 19th century. Now I know some of you are asking what about CFL’s (compact fluorescent lights)? We are now seeing them as replacements for the standard 60 watt bulb. Aren’t CFL’s the wave of the future? In my opinion CFL’s will not withstand the test of time. CFL ratings for life of bulb are maxed out at about 10,000 hours. That actually is a much better alternative to the standard incandescent bulb which only has a life of about 750 hours. However, with LEDs we are talking about a life of 50,000 or even 70,000 hours. WOW. If you had an LED on continuously 24 hours a day/seven days a week then it could last 6 to 12 years. If you figure that the LED is only on 8 hours a day, still every day, it would last for 18-28 years!!! For most of us, we would never have to buy a bulb again for our home. Can you see why the potential for LEDs to surpass CFLs is so great? Also, LEDs require very little energy to work which make them very “Green” energy conservers. So what’s the problem? COST. Even though the technology has shown us that LEDs are far superior to anything else, they are still expensive to make and therefore expensive to buy. One bulb equivalent to a 100 watt light bulb can cost $200.00. Imagine trying to replace every light bulb in your home. The costs are still prohibitive, but each and every year the technology is getting better and the price is coming down. I believe that within the next 5 to 7 years they will be affordable to the average homeowner. You see them now in flashlights, exterior lighting, and other small items like a reading light fixture. 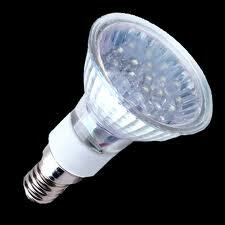 If you have a situation in your home where a bulb is very inaccessible, you might consider replacing it with an LED. Municipalities have gotten on the bandwagon and are using LEDs for such things as street lights and traffic lights. To them, the manpower cost to replace is much higher than to buy a more expensive much longer lasting LED. Because of their low voltage and long life, car manufacturers are using them extensively. Everyone is beginning to convert to LEDs. For now the CFLs will be the energy saving “Green” bulb of choice replacing the 60 watt light bulb for the home industry but don’t get too comfortable with CFLs. LEDs are very much on the horizon and will soon dominate the housing and commercial market for an energy saving, mass produced, cheap, bright light that will not have to be replaced for a very long time. I, for one, can’t wait for that day.